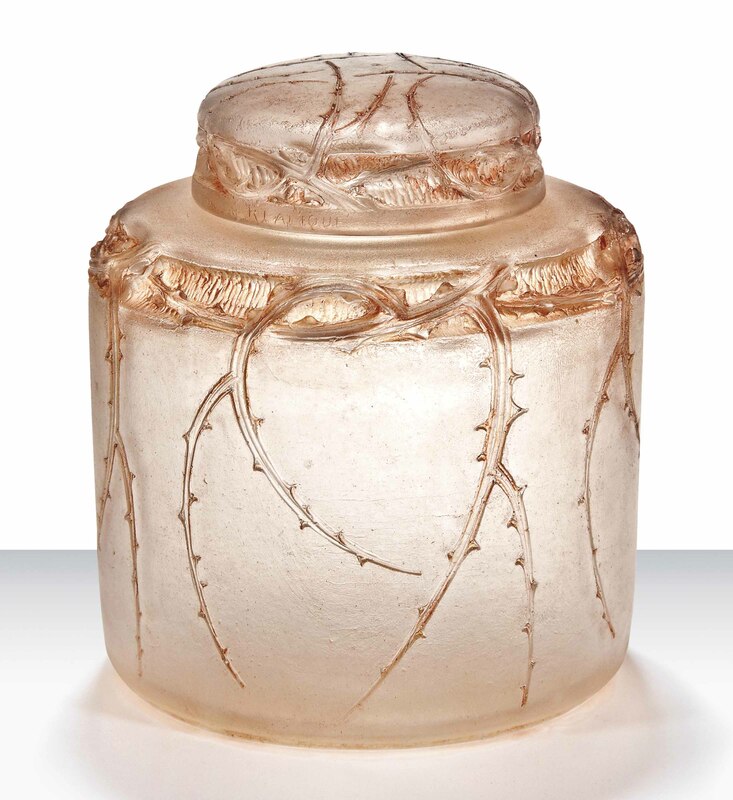 The present lot is one of the rare examples of cire perdue, or lost wax, an ancient technique adopted by René Lalique to execute some of his most remarkable designs. Cire perdue works are characterised by their textured surface and the absence of mould lines, both resulting from their creation process. These aspects are also exemplified by the other two examples of cire perdue glass included in the sale Épined Formant Quatre Pieds vase (lot 56) and Clématites, Feuilles en creux, Fleurs en relief vase (lot 67). The present lot bears another occasional characteristic of a cire perdue work: a finger print left by the creator himself as he sculpted it. Lalique designed a number of cire perdue vases with covers between 1919 and 1921 each with varying decorative friezes. This lot reflects his recurring fascination with briars and explores the motif both as a surface pattern and also in relief. The design drawing of this lot is illustrated in F. Marcilhac, René Lalique: Catalogue Raisonné de l'Oeuvre de Verre, Paris, 1994, p. 1009, fig. CP 201. A related design, CP212, is in the collections of the Metropolitan Museum of Art, New York.